Already 400 years ago, it must have been a spectacular view: Sebastian Münster, the great German Cartographer and Scholar, described it as “a terrifying thing to look at: water turns to foam and white smoke (sic), and no boat, no fish is able to overcome this obstacle” (1). It is the Cataracta Rheni, or the Rhine Falls (“Rheinfall”) as the cataract is called today. Situated along the Swiss-German border, the largest water fall in Europe is still an impressive sight: The Rhine river drops by 23 meters to form a miniature version of the Niagara falls – both places nowadays a popular tourist attraction featuring those little boats bringing the intrepid visitors to the spectacle as close as possible. Sebastian Münster (1488-1552) published the first edition of his Cosmographia in 1544. It was the first description of the world in German, and featured a cornucopia of illustrating woodcuts: maps, portraits, plants and animals, not to forget the ubiquitous monsters. 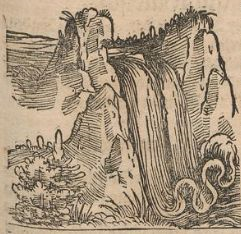 Although the description of the waterfall is rather precise, including the height of 12 “klafter” equaling roughtly 21 meters, the woodcut itself is rather schematic, depicting the river as a tongue-like, solid shape. Nevertheless, this small woodcut has been long held as simply the first pictorial representation of the Rhine Falls. Not any more.